As public purse strings tighten, pension funds are the most promising source of long-term funding for infrastructure projects, according to an OECD report supported by Oliver Wyman. Investment funds and insurance companies could also help to take up the slack in funding as traditional lenders and investors retreat from the rapidly changing project finance market. European banks, previously big players in this space, are cutting back in the face of Europe’s debt crisis and higher bank capital requirements. Japanese banks, on the other hand, are taking advantage of their ample deposits to expand project finance operations around the world. 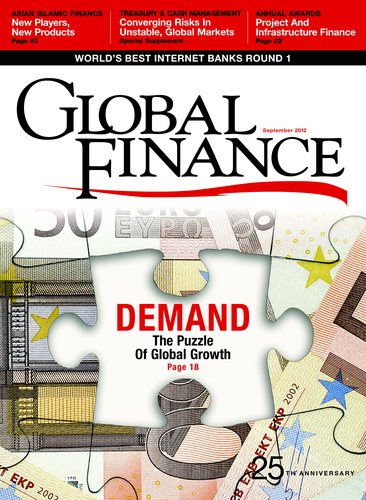 Some of the big emerging markets, such as India and China, are relying on development banks and government-owned financial institutions, rather than foreign commercial lenders. India was the biggest user of project finance over the past year. State Bank of India (SBI) was the top arranger of project finance loans globally last year. There are several reasons for this, but one is the availability of local-currency funding to eliminate foreign exchange risk, says Marcia Wiss, partner at law firm Hogan Lovells. “The league tables say it all,” Wiss says. “SBI has been dominant since 2008.” India, which has enormous infrastructure investment needs and slowing GDP growth, also has weak capital formation. “Historically, India has been exclusionary toward foreign direct investment, although it opened up in 1991,” Wiss says. “Restrictions on foreign ownership of financial institutions remain, however, and so many of them lack the long-term, close connection to project sponsors that the SBI has, and it is important to be near your customer.” India is famous for its red tape and regulatory bottlenecks, according to Wiss. “Things are not moving at the federal level, so project sponsors are trying to deal with business-friendly Indian states,” she says. Brazil is another country with an enormous demand for infrastructure investment. The need to build facilities and access roads as the country prepares to host the 2014 World Cup and the 2016 Olympics has added to the sense of urgency. The European Union recently announced a project bond initiative to stimulate investment in infrastructure as part of its growth pact. The plan is to use EU guarantees to improve the credit standing of private entities that need to issue debt for projects. The European Investment Bank is evaluating projects for a $5.5 billion test run. 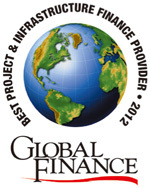 Global Finance has introduced these awards in recognition of the growing importance of project and infrastructure finance in supporting economic growth. We have selected winners across 10 global and seven regional categories.